President Donald Trump has accused the FBI of failing to prevent the shooting attack that left 17 dead at a Florida high school, whose surviving students announced a demonstration next month in Washington with the goal of demanding stricter gun control laws. Trump's denunciation of the FBI comes as the president faces harsh criticism of his ties to the National Rifle Association (NRA), the powerful firearms lobby in the United States. The shooting also exposed a serious flaw in the FBI, which admitted it received a Jan. 5 call from a relative of 19-year-old shooter Nikolas Cruz warning of his aggressive behavior and murderous intentions. The Miami office was not informed, however. Local police were also warned of Cruz's dangerous behavior, CNN reported. Her foster mother, who died last year, "has repeatedly called for the presence of the police in her home to help her face the fits of anger, her threats and her self-destructive behavior." "It's a real shame the FBI has omitted all the signals from the Florida High School sniper. It's not acceptable, "the American president tweeted. "They spend too much time trying to prove the Russian collusion with the Trump campaign - There is no collusion. Go back to basics and make us proud of you! "Added the president. Since May, however, it is no longer the FBI leading the investigation into Russian interference in the electoral process, but special prosecutor Robert Mueller. The day after the shooting, Trump insisted on the assailant's mental problems, with no mention of the right to possession and possession of weapons, guaranteed by the Second Amendment of the Constitution, or without referring to semiautomatic weapons, such as the AR-15 rifle used by shooter. Students who survived the massacre announced a demonstration, which they called March 24 for "March for our Lives" in Washington, which will aim to enforce stricter gun control laws. During a rally Saturday night in Fort Lauderdale, Fla., A survivor of the attack strongly denounced the president's ties to the NRA. "To every politician who accepts donations from the NRA, shame!" Shouted Emma Gonzalez, attacking Trump for the millionaire support his campaign received from the arms lobby, while encouraging the crowd to repeat: "What a shame!" "What a shame, what a shame!" Shouted the demonstrators. "If the president wants to come to me and say in my face that it was a terrible tragedy and ... As nothing is going to be done about it, I'm going to ask cheerfully how much money he got from the National Rifle Association," said Gonzalez, year of Marjory Stoneman Douglas High School of Parkland. "It does not matter, because I already know. Thirty million, "he told the crowd that participated in the march, which included students, parents and local officials, citing the sum spent by the NRA to support Trump's campaign and defeat Hillary Clinton. Dividing this amount by the number of shooting victims in the United States since the beginning of the year, Gonzalez asked, "How much are these people worth to you, Trump?" 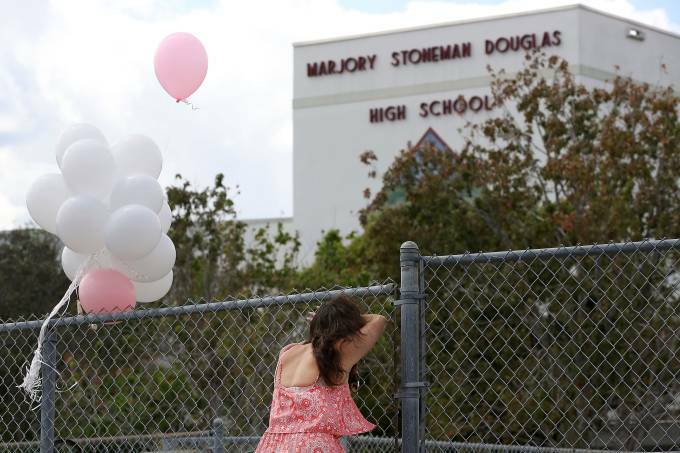 Gonzalez hid in the college amphitheater, when Nikolas Cruz opened fire in the hallways, leaving 17 dead, most of them teenagers, before fleeing mingling in the crowd. The shooter was arrested an hour later. "The fact of being allowed to buy automatic weapons is not a political issue, it is a matter of life, or death," she said in a conversation with AFP. Nikolas Cruz received psychological attention for his behavioral problems, but benefited from very loose legislation in Florida, and was able to buy his weapon legally last year. There were many warning signs about the risks he posed. A social investigation carried out by an episode of self-mutilation revealed in September 2016 that Cruz wanted to buy a firearm. "Cruz has recent cuts on his two arms and has stated that he intends to buy a firearm. We do not know what purpose he wants to buy a firearm for, "says a concise report from the Child Protection Service, quoted by the Sun Sentinel newspaper. Although these facts had "certain implications" for their safety, the agency concluded at that time that the young man was adequately treated by his college and an institute specialized in mental health. Nikolas Cruz was treated, "because he was designated as a vulnerable adult due to mental disorders," according to the newspaper.